After cancer treatment, my hair grew back in wild curls that I dyed platinum blonde, symbolizing my pursuit of a more creative life. “Now what?” I asked. How does one pursue a creative life? The same way nurses create a patient care plan: with a focused goal. “Huh?” I hear you say. Nurses ignore hunger. We rationalize it’s OK we haven’t peed for 12 hours, because we haven’t had anything to drink either. Is anyone surprised we’re numb in the creativity department? If you need a Doppler to find your dreams, take heart! There are tools for restoring creative perfusion. Using the hour you have set aside weekly for creativity, (you are setting aside an hour weekly for creativity, right?) begin remembering your childhood self. What did he or she enjoy? For me, it was drawing, riding horses, writing, collecting seashells, cooking, and hiking. I made greeting cards. Not much about nursing. I wasn’t particularly athletic, but maybe you were. What did your childhood self dream of doing? Write it down. 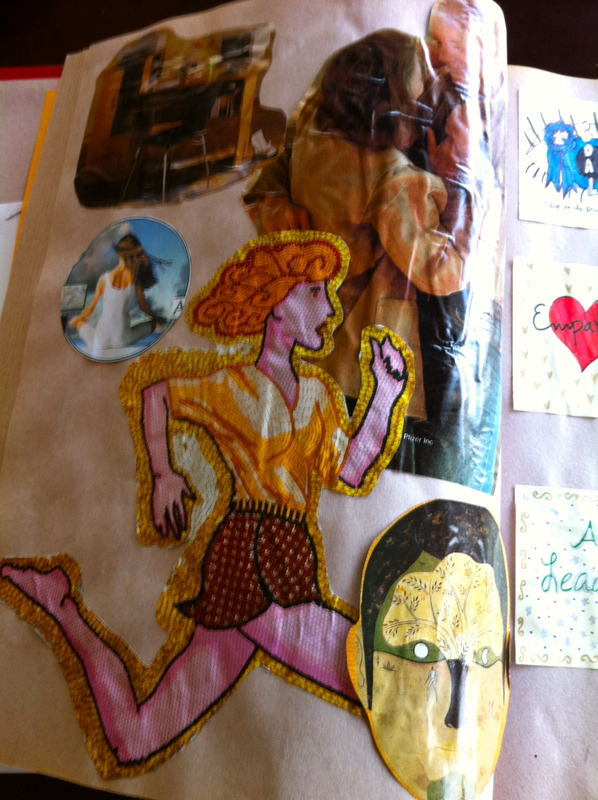 This exercise clears clutter: Tear pictures from old magazines of everything that catches your eye. 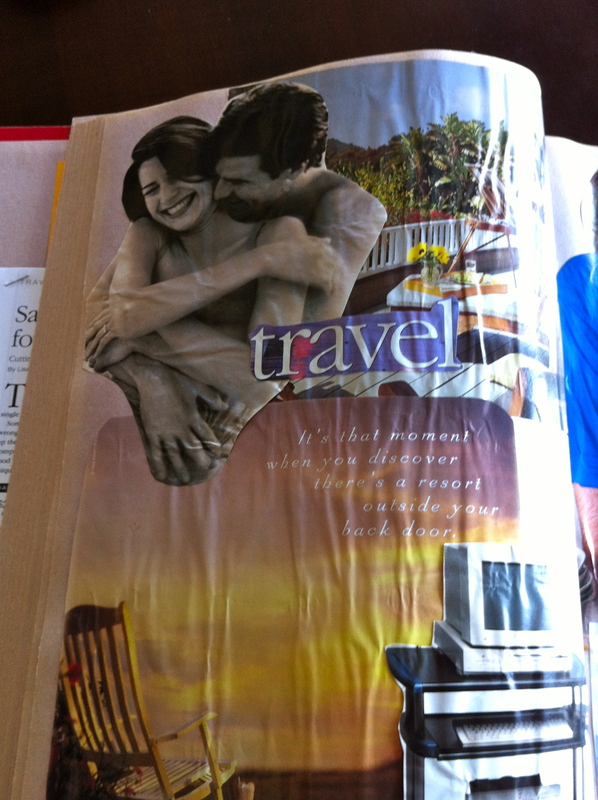 Using a glue stick, randomly paste the pictures into an inexpensive scrapbook. Don’t worry what it looks like. This is an exercise in free association. Do it over several weeks, compiling enough images to spot trends. Pay attention: Your subconscious is talking! I discovered myself clipping pictures of lofts with contemporary furniture, a far cry from my country-style living room. Pictures of clothing were elegant, urban fashions, not my uniform of jeans and comfort footwear. Maybe your pictures depict people, not things. In that case, what are they doing: traveling, creating something, dancing, or playing a musical instrument? Are they back in school for that BSN or advanced degree? If a picture is worth a thousand words, what are yours saying? This project can be accomplished using Pinterest. However, the paper version provides privacy, perhaps fostering candid responses. If Pinterest works for you, go ahead. Our brains are trainable. Vision boards are a visualization tool. Training your brain to “see” the life you want helps achieve it. Using the information you gathered from the previous two exercises, glue pictures from magazines representing the life you want on a large piece of poster board. A single mother at the time, my pictures represented falling in love and a happy relationship, along with pictures of an art studio, places I wanted to visit, learning Rieki, and living into old age. I made mine during cancer treatment — your patients might enjoy making this project too. Through these exercises, I discovered I was cleaning a rarely used guest room. My dining room sat empty because I preferred impromptu dinners with girlfriends served on the coffee table while watching a movie from the couch. Clearly, I dreamt of a lifestyle very different from the one I maintained. I changed that. Are you living the life of your dreams or simply the one you find yourself living? If you are, how did you find it? This entry was posted in Posts About Art & Nursing and tagged art and nursing, creativity, health, home, lifestyle, nurse blogs, nurse lifestyles, nurses, RN blogs, scrapbooks, the creative life, vision boards, visualization by jparadisirn. Bookmark the permalink.